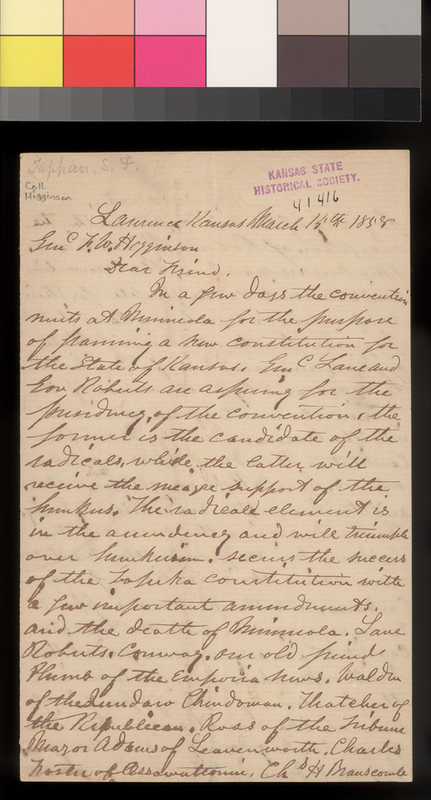 In this letter, written from Lawrence, Kansas Territory, Samuel Tappan informs Thomas W. Higginson of the state of affairs in Kansas Territory. He begins by mentioning the constitutional convention that would soon meet at Minneola and hopes that the free state side would be triumphant. Tappan also mentions the recent election for mayor of Lawrence, stating that Carmi Babcock won over James Blood. The last page, tacked on as if it were a separate note, gives a brief summary of where influential leaders were currently located, so Higginson would know of their whereabouts.